Today I want to talk about this idea that time heals wounds. I think we can all agree that divorce causes huge chaos. It’s the end of something that was born of love, cemented at a ceremony and carried the combined hopes and dreams of those who shared your relationship and rooted for you. Those who haven’t been through divorce can’t fully comprehend the pain, humiliation and sense of confusion, loneliness and failure. During my divorce I saw a therapist for a while. She told me that as I had been married for seven years, it would probably take me at least 18 months to get over the relationship and that I should ’take my time’. She commenced the therapy sessions by taking me back to an incident from my youth. I was four years old and had been abandoned by my parents outside Sunday School. She linked my feelings related to the divorce to the fear I’d felt then. We explored that incident for some time and after two hours of deconstruction (and a hefty bill later), I left feeling thoroughly disempowered and confused. Not only was I annoyed with my former husband, I was now annoyed with my parents too. > The healing process didn’t feel transparent, it felt like the therapist had the secret to healing and the only way I was going to find out the secret was to commit to being deconstructed on a weekly basis for 18 months. > I felt that there was no goal or focus to my healing. The focus was instead on me fitting in whatever I needed to say within 1 hour. > I was surprised that therapy didn’t encourage or talk about the necessity in creating a ‘container’ to ensure I was held together during my divorce. > My healing also did not fit into the ‘let’s meet once a week for 1 hour’ structure. I required a phone call here, a text there, an email at 1am or a session with 1 day’s notice. I wanted a friend to walk with me through the process and not interact in a conventional way. Everything in my life was moving so fast that by the time my weekly session arrived, everything had changed and I spent the session catching her up versus actually making any real progress. I decided that there had to be a better way and created the naked divorce process to eliminate these specific issues. Over time and working with countless clients, I have found that like me, there are people who wanted to explore alternatives to therapy and an alternative to, as one of my clients put it; ‘washing myself in the same dirty water week in and week out’. I am sure you are familiar with the old adage that ‘Time heals all wounds’. This concept has become so synonymous with healing, that the thought of healing quickly feels fake and unbelievable. 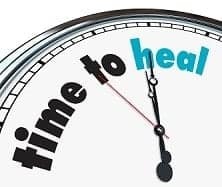 Therapy has consequently based it’s practice and disciplines on the premise that you need a great deal of time to heal. Without running the risk of sounding too philosophical, time is an artificial structure, much like a state, provincial or country line. Have you ever seen a state or provincial line? I used to look for them on the ground when I was a kid and never found one. What I tell my clients when they say ‘Time heals all wounds’ is that time doesn’t heal anything, time simply passes. It is what we do with our lives while time is passing that either helps us, heals us, or mires us in the past. Many people, mistaking the turbulent transition for the change itself, decide that they prefer the bad old days. They lose faith and go back to the old way of life where they are avoiding the pain or finding a comfort zone in their healing. When we do that, when we run counter to our gut knowing that change must come, we have to rationalize our cowardice. “Better the devil you know,” we say, “than the devil you don’t know.” And so we cast out the world that might have been and remain stuck in old ways. Maybe this passivity is itself the devil it fears. It pretends to be our ally, but it is really our tormentor. The timid part of ourselves fails to realize that more solutions would be found if more of us participated — if we didn’t “wait and see.” Seeing and doing are joined at the bone. In my work with men and women in the area of divorce coaching, I’ve noticed that some seem to have an ability to accept the hurts and disappointments of life and move on. They are goal orientated and know that the future is where they’re headed, not the past. Others, however, seem to get stuck. They remain in the past and in their pain, as if those events had just happened, playing the “wait and see” game. Time played no factor in the one group moving on and the other group remaining stuck. It had to do with what they did within that time that made the difference. Likewise, I could have taken six years to get over my divorce, but the steps would have been the same had I taken 21 days, 21 months or 21 years to do so. There are no shortcuts to getting over a failed marriage or life-changing trauma, but there are guidelines you can follow to get through the trauma efficiently and effectively. When I considered my therapist’s advice to ‘take my time’, I decided it was probably in her best interests that I do so as her livelihood depended on me needing her inputs every week. Time is an important factor in healing, but consider that telling people you ‘need lots of time’ is often an excuse to delay healing. The question is not how much time it takes to heal, but rather how you spend that time. I had to reach an understanding that it was only myself putting the brakes on my healing. So if you put this concept of time aside, imagine how amazing it would feel to have the new life you dream of. The new you. The woman who is over her old relationship, empowered, happy and at peace? This book is an invitation into a world where life and healing is not a struggle. Where living your dreams is a way of life, not an unreachable destination. To many of you, this might sound like a fantasy. But I promise: No matter what brought you here, no matter how deep or painful your emotions are or what your personal story is, success is possible. > What steps did you take that were healthy and healing? > What steps did you take, or not take, that hampered your recovery? > Keeping all that in mind, how are you spending your time day-to-day in healing from your divorce? Thanks for your sharing editor. Best Regards.